For those who missed it, there were several beta start times which varied depending on your location. The pre-order was available from Sept 4, so if you missed it, tough luck. Since the start time has now passed Battlefield 5 open beta is now open to everybody. Some early access beta codes have also been flying around on social media, so if you’re lucky, you can still gain access that way. But, the date that really matters is the beta end date, which is September 11, where the Battlefield 5 Beta will draw to a close at the following times: 3 pm PT, 6 pm ET, 11 pm BST and 12 midnight CEST. Even if you somehow missed the initial start date for the Battlefield 5 open beta, the good news is, there is already a client available for those who want to download Battlefield 5 open beta ahead of it going live. All you have to do is hit up the PlayStation, Origin or Xbox Store and search for Battlefield 5 open beta, and hit the download button. Unlike some of the recent beta versions that have been released such as CoD Black Ops 4, there is no information on any exclusive period for any particular platform, so we’ll just go ahead and assume that there isn’t going to be any. Battlefield 5 open beta is going to run on PS4, Xbox One and PC simultaneously, which is great news since all gamers, regardless of what platform they’re on will be able to enjoy the game, even if it’s a beta version. That said, the developers of the game still seem to have reserved some exclusivity with their latest beta release. The only exclusivity you are going to see comes to those who have pre-ordered the game, which gave them access to Battlefield 5 open beta a full two days early than the rest. Once you have downloaded the client, you will have access to two modes of gameplay in the Battlefield 5 open beta – Conquest Operations and Grand Operations. That being said, players were only able to play the first two days of Grand Operations mode, which only lasted two matches, rather than the full four days, which was anticipated. Both modes, however, can be played on two separate maps – Artic Fjord and Rotterdam, which is the reason why the Grand Operations mode only lasted two days in the open beta version of the game. The four classes in the Battlefield 5 open beta are going to be Assault, Recon, Medic, and Support. In the Artic Fjord map players will be battling on snowy Norwegian landscapes. Players will be able to access both Conquest and two days of Grand Operation titled, “Fall of Norway”. These are going to be in-game days, and not the 24-hour kind. The good news is, the Grand Operations mode contains multiple days, with a game mode featured in each. In Fall of Norway – Day 1, players will spend in Airborne mode, where you will be paradropped down to the battlefield and will be on either side of the fight, accompanied by explosives that are going to be deployed on each of the control points. Day 2 of Fall of Norway is going to feature Breakthrough. In case you were wondering, this is where your team will either attack or defend vital sectors in the area. It is important for players to remain aggressive or go with tactical planning to make sure you can keep the enemy at bay. In the open beta version, you will also get to explore some new scenery such as Rotterdam. Here you will be battling in the streets of the Dutch city in a pre-war state, which is going to be new for seasoned players of the game. Deploy on the map and go with the game mode Conquest, which is the classic Battlefield game mode and will return you to the games classic roots in terms of controls. Here, it’s important to note that Classic is going to be a 64-player game where you will be split into two teams to control over key flags that are located on the map. It is important to hold the maximum number of flags to drain the score of the opposition and win the battle. 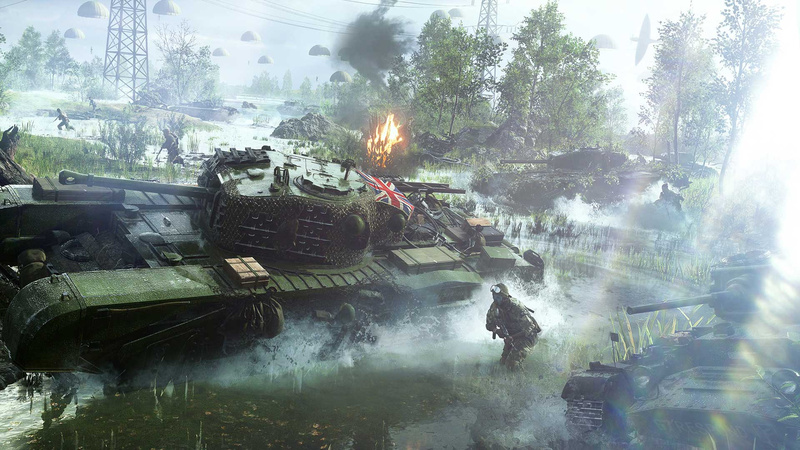 Battlefield 5 open beta gives players access to five iconic WW2 tanks and several aircraft (seven to be exact), which adds to the excitement during gameplay. Some of the tanks on offer is going to be the Churchill Mk VII, the Valentine Mk VIII, the Tiger I, the Churchill Gun Carrier and of course, the Panzer IV. For those who would prefer to fly the options in aircraft is going to be, the Spitfire Mk VB, the C47, the Bf 109 G-2, the Ju 87 Stuka B-1 and the Ju B7 Stuka B-2. Apart from these players will also be able to fend off any enemies in the sky with the help of stationary and towable AA guns to provide further support for your team. In case you were wondering, there are also anti-tank guns that are towable and stationary which can be used to silence pestering tanks on the ground. While the supply canister drops are going to be new, the open beta will also contain the JB-2 and V-1 Rocket strikes. The supply canister drops are going to mainly contain health and ammunition which is going to be para-dropped on the battlefield, and will set you back 7,500 requisition points. Genuinely excited for this game!